Home » 100 Lucky Juans , Cebu Pacific , Cebu Pacific Contest , Cheap Airfare from Dubai to Manila , You say Dubai I say Hello » Cebu Pacific: You say Dubai, I say Hello! I'm the kind of woman who'd rather book a hotel stay than buy a gold necklace. I'd choose food in a fancy restaurant over a new pair of shoes. And I'd rather spend thousands for a plane ticket rather than a designer bag! :) But I'm no big spender! Most of the hotel stays, dine-outs and plane tickets were on promotional offers. I think that explains why I went crazy over Cebu Pacific Airline's "You say Dubai, I say Hello" advertisement. Who doesn't love cheap airfares? I was so overjoyed! I told everyone at work about it, shared the ad on my Facebook Timeline and I even sent a message to my mom! Cebu Pacific's Dubai-Manila flights will be operated on the Airbus A330-300 aircraft with a configuration of more than 400 all-economy class seats. 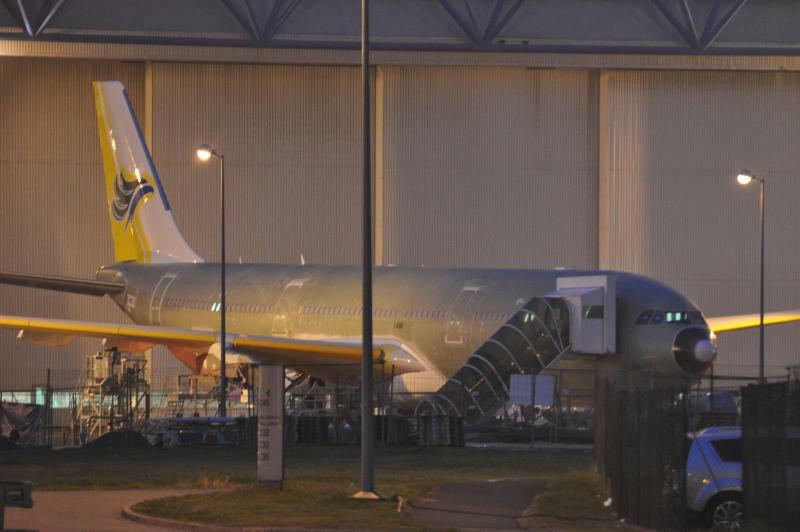 Cebu Pacific will be utilizing a brand new plane for all Dubai-Manila flights. Guests can also enjoy WiFi connectivity in-flight. Passengers will be devouring sumptuous Filipino dishes in-flight. 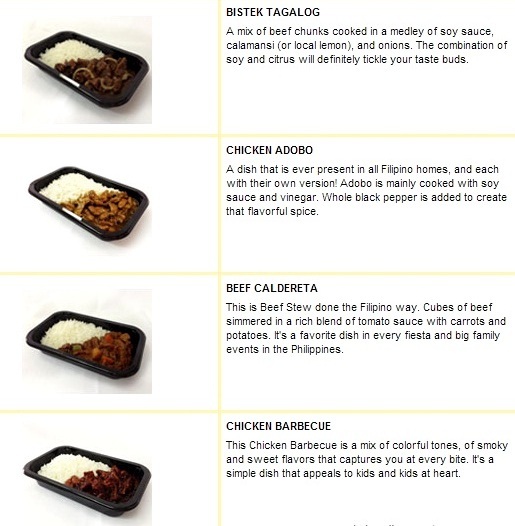 You can choose from Chicken Adobo, Chicken Barbecue, Bistek Tagalog or Beef Caldereta. That's a perfect start of your homecoming journey! Cebu Pacific will operate direct daily flights between Dubai and Manila starting October 7, 2013. The airline will be the only Filipino carrier to fly direct to Dubai. Yay, no stop-overs! Daily flights from Manila to Dubai are scheduled to depart at 4:40PM (Manila time), while flights from Dubai to Manila depart at 11:10PM (Dubai time). Now, who's excited? Picture me raising both my hands in the air! :) Hey, don't book your ticket yet. 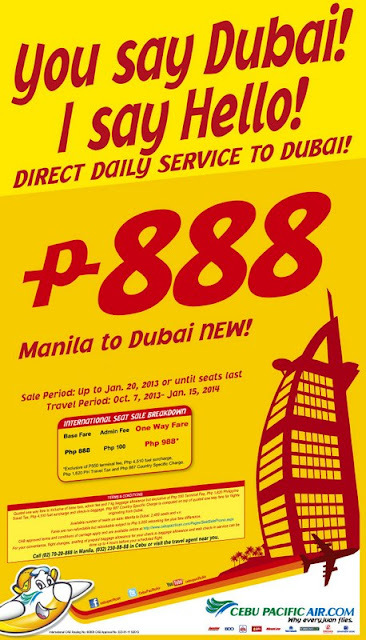 I know Cebu Pacific's Dubai-Manila airfare is cheapest one you can get, but you can have it for FREE! Cebu Pacific will be giving away 100 round trip tickets to 100 Filipinos in Dubai. Visit Cebu Pacific's Official Facebook Page and look of the "100 Lucky Juans" Facebook App, or you can click here. The "100 Lucky Juans" contest runs from May 13 to August 18, 2013. Join and be a UWInner! CebuPacific talaga remains to be aggressive. I just hope they'd improve their customer service, too. I always unclick the food option on Cebu Pacific so I've never tried it. Those look good though. Hmm, interesting ha. I wanna join! very enticing especially for me who hasn't have any experience traveling abroad. Wow! That's a great deal! Is it easy to go to Dubai? Passport lang ba? Hi Mys, you need to apply for a tourist visa. If you have a relative here, it would be easier. Cool ah! Especially the bit about wifi in-flight. Very handy for Instagrammers, haha! Cebu Pac really made it possible for almost everyone to go abroad. A few years back, traveling to really far places is only for the ones with more money. 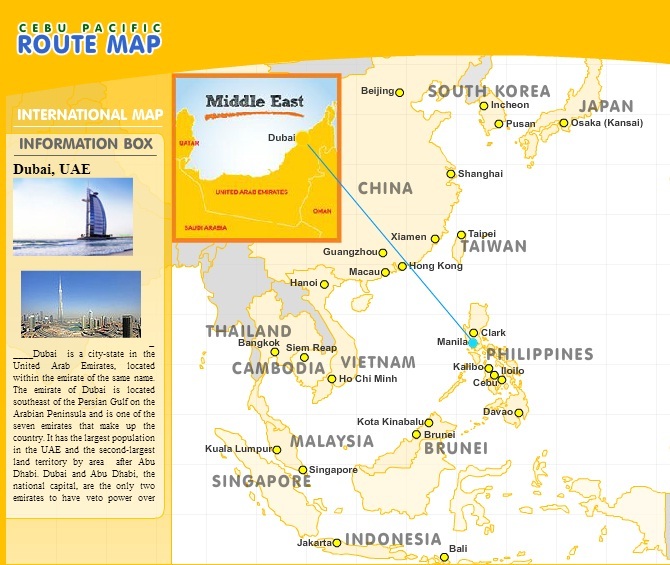 I wanna go to Dubai, I love Cebu pacific, they offer exceptional prices for plane tickets both domestic and international. Ang galing!! I want din! PS: You want to spend money on experiences, not on things. I wish I could say the same for myself! Haha! i love low fares too and Cebi Pacific promos are totally addictive. We took advantage once when we brought our parents to Manila. I've travelled by Cebu Pacific before from Singapore to Cebu and it's really good value for a budget airline. Sorry if this is an advertorial ah, but Im kinda not liking cebu pac na. I was and still am a cebu pac customer, however over the years their services have become, well, a downward spiral. laging delayed, seats are very dirty and planes are old and smelly na. Yes it is a budget airline, pero when I went to mnila via jet star recently, mas nagustuhan ko. Im not saying I will stop patronizing cebu pac, kaya lang sana mas maimprove na nila services nila kse dati it wasn't like that naman. Is Cebu Pacific owned my the Gokongwei? I read that this is one of their goal, to land every Filipino in the world with a least cost. I will be travilling via CebuPAc for the 1st time this June. Sana they remain faithful to their word "always on time", parang sa mga nababalitaa ko lagi na delayed flights eh. But yes, they always offer promos you can't resist. Sana nga lang, kahit cheap cost, excellent service pa rin. Lots of times kasi, pag budget fares, the services suffer eh. I've been reading a lot kasi about delayed flights. For someone who values time and schedules, that could really piss me off hehehe. I hope Cebu Pac has improved a lot. I wanna join too! Because I want to fly to Dubai also! This is a great news for us and most especially to the Filipinos in Dubai. What is more interesting is there's a free wi-fi. Which means di na nakakainip and you can blog, chat, Instagram, Candy Crush, etc. while you are up in the air. This is nice but sana the service is okay naman. Airlines and travel websites supply larger discounts and Cheap Airfare costs to people that book on-line as a result of it saves them the overhead prices of printing and handling a paper price tag. thus make certain to use the e-ticket possibility once getting your plane tickets on-line.